Watch full One Piece Season 15 Episode 4 English Dubbed full HD online. One Piece Episode 520 English Dubbed online for free in HD. Big Guns Assembled! The Danger of the Fake Straw Hats! 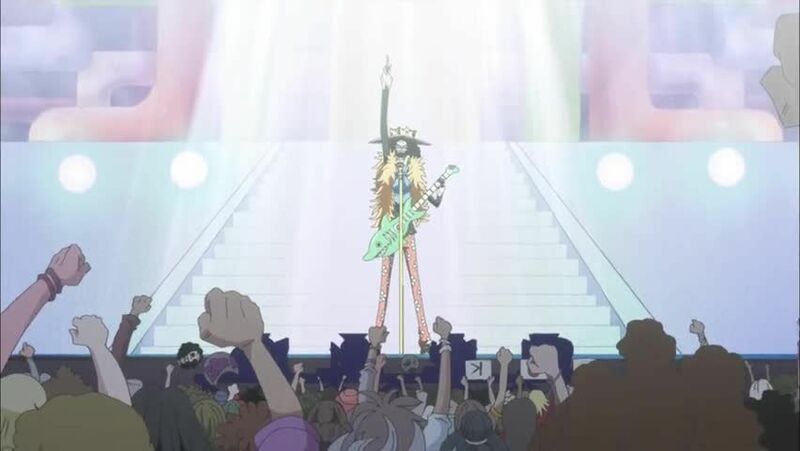 At the Sabao Dome, Brook finishes his song. Meanwhile, Caribou frightens a Marine, digging a live grave with Coribou, and Fake Luffy rallies the pirates. However, the real Luffy gets caught up in the situation. Meanwhile, Brook is confronted by the Marines and his managers. At the Thousand Sunny, Usopp and Chopper reunite with Franky. The shipwright then reveals that not only did he create a new version of himself, but he can change his hairstyle by pushing his nose, while Nami boards the ship. Upon her arrival, Rayleigh and Shakky inform the others about what has happened. Meanwhile, Brook informs everyone that Luffy is alive and performs a new song before departing. Rayleigh instructs Nami about how to control the ship and Shakky reveals that she wiretapped the Transponder Snails. Rayleigh says that Luffy will be arriving soon; the Straw Hats and Shakky join him in awaiting Luffy’s arrival. 5 / 5 - 52 ratings.